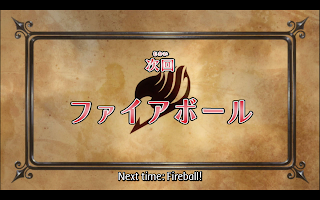 The first part of this episode is exposition heavy, as Natsu explains where he and his friends are from, and asks how to get to the capital so he can save the rest of his guild. 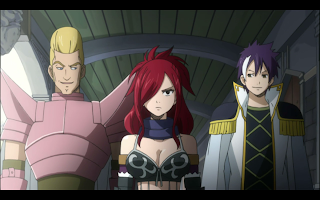 The Edolas Fairy Tail guild explains that since magic is a limited resource the king claimed all of it and outlawed mage guilds. Because of this they are hunted. 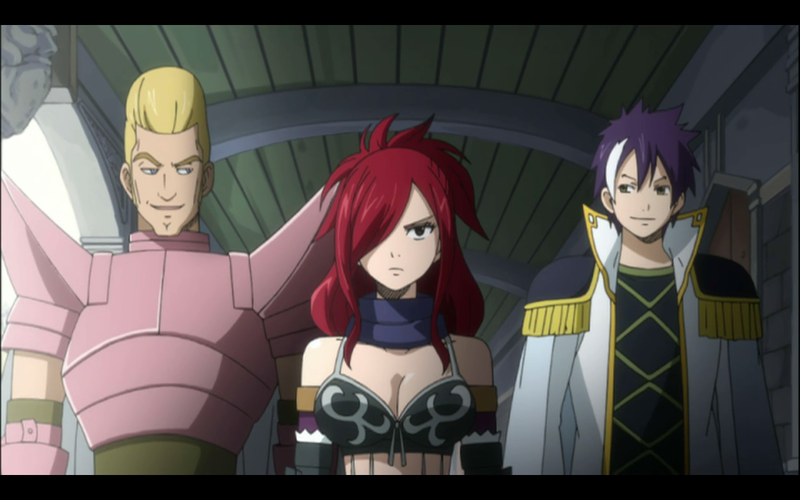 The scene shifts to the capital city, where Erza Knightwalker and the other captains of the army are gathering for a meeting. We also get a first glimpse of the king, who fits the megalomaniac monarch trope to a T.
Natsu and group are traveling through a desert to reach their friends at the capital, but Natsu stops to try and catch a frog as a present for Lucy. He has a strange way of showing his affections, at least I think that’s what it is. The frog grows large and attacks them. 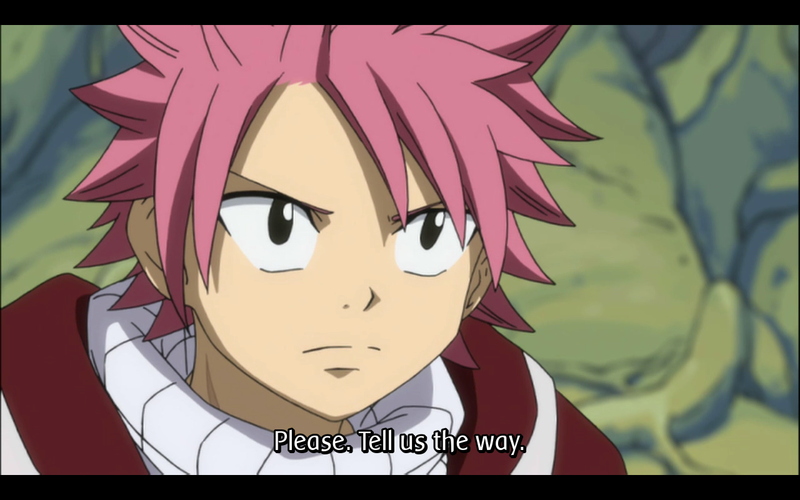 Natsu tries to fight it, but without his magic his punches just bounce off. They are saved by “Scary Lucy” who denies that she was worried about them, and offers to guide them to the capital. Gajeel makes an appearance for a little bit, as he is on his search for the giant lachryma crystal the guild is trapped in. He hears about his alternate self, who is apparently an anti-government writer, and goes looking for him. 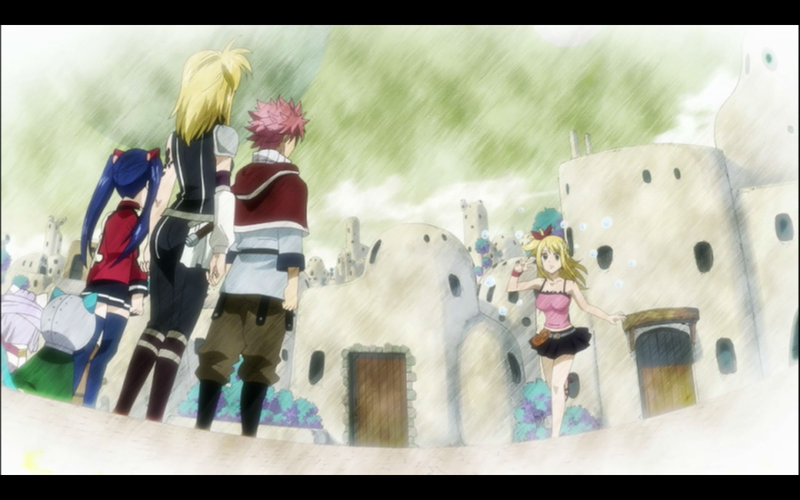 In the meanwhile Natsu and his group arrive in the same town Gajeel is in. Scary Lucy takes them to buy some magic items, which wizards use to perform magic since they can’t store magic in their own bodies. They rest at a cafe, while Scary Lucy has a laugh over what regular Lucy is like. The are attacked by royal guards, and are only able to escape because Wendy’s wind magic goes berserk and blows them all away. They hide inside a house until they hear the guards telling them they are under arrest. Only the guards aren’t talking to them, they’re talking to someone with a very familiar voice. 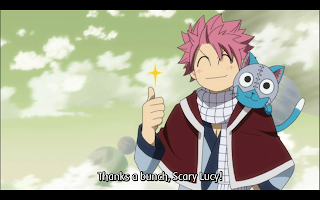 Natsu opens the door and finds the Lucy he knows being arrested by the guards. Before he can act to save her, she pulls out her key and summons Scorpio, who she then uses to defeat all the guards. With the guards defeated Lucy reunites with her friends, and herself. 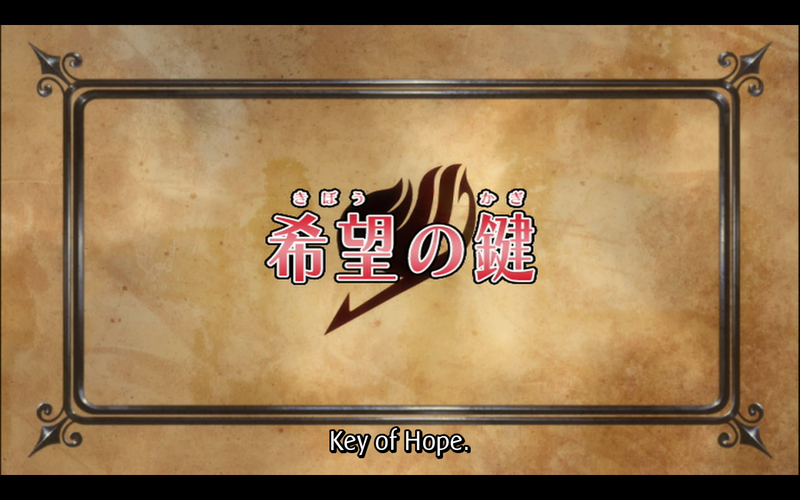 This episode is much stronger than the last one solely because there was motion. With the flow of the story moving forward the sense of progress is much greater than when the characters stay in basically one place for an episode. 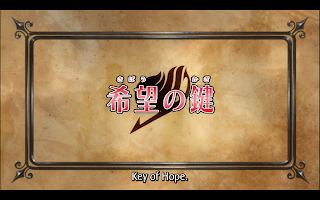 Both types of episodes can be good, but I much prefer this style over the stationary type. The cliffhanger, with Lucy being able to use her magic, is well placed to keep viewers coming back for the next episode. This current arc is definitely shaping up to be much better than previous episodes suggested.